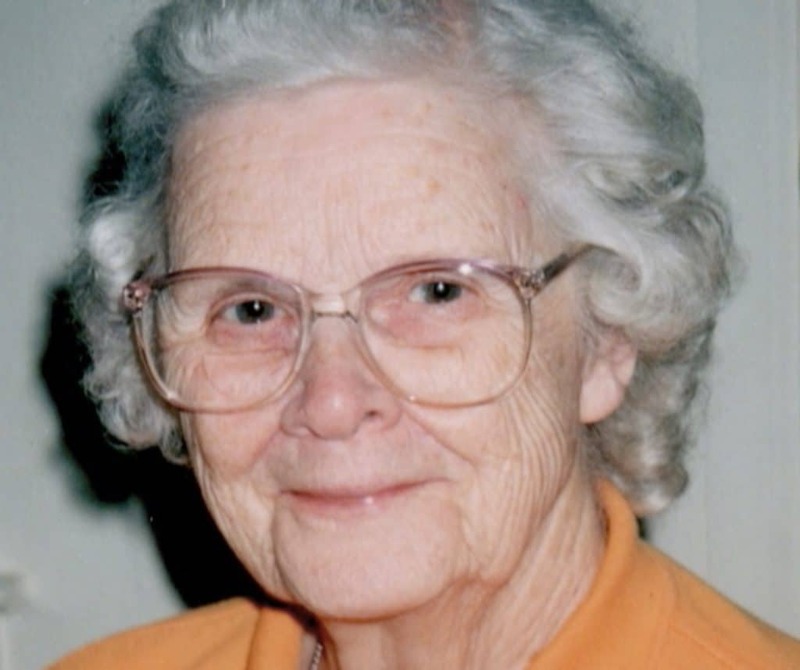 Brighton NY: Leonilla Agnes Hones (nee McClear) was born in Deerfield, Michigan on February 15, 1919, and died at Benincasa hospice in Mendon, New York, on November 30, 2018. Leonilla was the third of 12 children born to Agnes Robb McClear and Leo McClear. She outlived all her siblings, but she remained close to her many nieces and nephews (and their children) throughout her life. Leonilla graduated with honors from Nazareth College in Kalamazoo and taught Latin. In 1943 she married Donald Francis Hones, the brother of her college friend, Margaret Siczek. Leonilla and Don had 11 children, nine of whom survive. They are Kay Ellen, Gregory (Gail), Karen, Mary (Annie), Gerard (Debbie), Sarah, Agnes (Jim), Donald (Persida), and Luke (Claire). Sons Timothy Hones and Thomas Hones pre-deceased Leonilla, as did her husband, Don. She is also survived by ten grandchildren, Ange (Stephan Morais), Yvea Eaton Moore, Cosmo and Mercedes Houck, Joshua, Gregory, Keri, Orion, Ariana, and Marcel Hones, and two great-grandchildren, Felix Morais and Logan Moore. Leonilla raised her family in Ypsilanti and Albion, Michigan, living in the state of Michigan until she was 80 years old. She and Don then moved to San Francisco where three of their children, and granddaughter Ange lived. After Don’s death, Leonilla moved to Rochester, New York, to live with her youngest daughter Agnes’ family. Her grandson Cosmo and granddaughter Mercedes were very much a part of her life over the next years, Mercedes, especially, living with her and caring for her until the end of her life. In Rochester, Leonilla was very active in the community of Our Lady of Lourdes Church. Her friends brought her communion when she could no longer walk to Mass. She counted on the daily visits of Sister Marie Joseph, Joan Hanna, Joan Donovan, Joan Blair, and Jean Clancy. Leonilla opted to go the palliative care route when she was given a cancer diagnosis near the end of her life. The first rate U of R hospice team, including health aides Gloria and Anya, nurses Deirdre, Jason, Kim and Stacy, social worker Jill, and healers Michelle, Daniel and Angela, took such good care of her and guided her as she prepared for her death. Donations in Leonilla’s memory can be made to House of Mercy in Rochester, New York or Benincasa hospice in Mendon, New York. A memorial service to honor and celebrate the life of Leonilla Hones will be held at Our Lady of Lourdes Church in Rochester on Saturday, December 22nd at 10 a.m.